So, unless you have been living under a rock for the past week you would know that the whole world has been going crazy for the new book featuring our favourite wizard, Harry Potter. The Cursed Child, which started off as a play in London has now been published as a script book easily accessible for fans around the world to read. It takes place 19 years after the events of The Deathly Hallows and its known as the final story. Being a major Potterhead I knew I had to get my hands on a copy. A few months ago I was walking past my local Waterstones and advertised in the window was a sign about preordering the book for half price, there was also a sign saying if you ordered the book in store you get a ticket for two for the launch event happening in store on the evening of 30th July. My inner fangirl went wild at this and instantly went into the store to preorder my book and get my ticket to the launch event. I'd never been to a book launch event before and was really looking forward to it. I couldn't wait to be surrounded by fellow fans of Harry Potter and enjoy the night. Soon enough the night rolled around and I couldn't stop my excitement! As I heard that we could dress up I made sure I had an outfit ready. 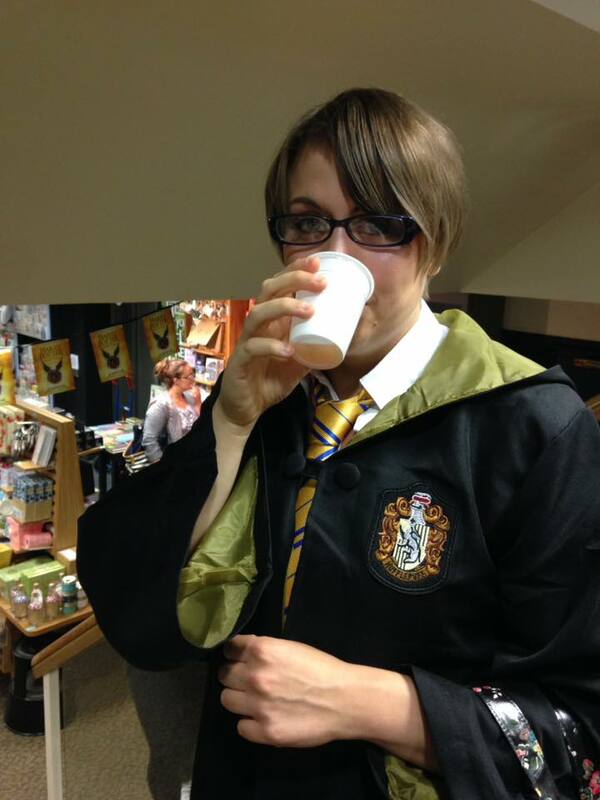 I'd decided I was going as a Hufflepuff student, as Hufflepuff is my house and I am rather proud of that fact. I managed to get a cloak and tie from Amazon for a very good price and a shirt and skirt from Primark. I felt happy that I'd managed to pull together an outfit for under £25 roughly. Also, I know that I will be using it again for Comic Con in London in October. 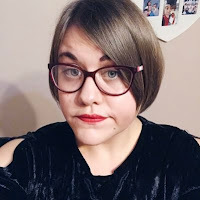 I looked pretty good all dressed up as I made my way to Waterstones with my Mum who as a fellow Potterfan decided to come with me. When we got there there was already a long queue forming outside and this added to the anticipation. After waiting for what seemed to be forever the doors to the store were opened and we were let in. The store was decorated in a magical way and it was like I'd stepped into Hogwarts. There were loads of activities to do such as puzzles, wordsearches, quizzes, pin the head on Fluffy (which was amusing), Deathly Hallows part 2 was playing in a corner and there were also sections where you could have your photo taken. I must admit I think I liked that the most! 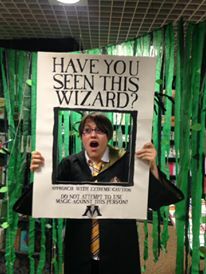 I was taking pride in my costume and the fact I was a Hufflepuff. I think many people went to town on their costumes! Throughout the night I spotted Rita Skeeter, Bellatrix Lestrange, Professor Sprout and Mad Eye Moody. It was amazing how much thought went into each costumer and it really did show how much the magic of the wizarding world meant to some people. I think my favourite part of the night was the 'potion' making. Obviously it was just using different drinkable liquids but it was rather amusing and made a lot of people laugh. We got to make a 'love' potion first and I joked around that it would make my boyfriend propose (sadly it failed!) we then made felix felicis or liquid luck and that didn't work either! How sad! It was lovely seeing the young children that had turned up get involved and I found it rather sweet. About half an hour before midnight everyone was getting ready and excited to receive their book. To calm us all down one of the staff members did a reading from the Deathly Hallows. I hadn't been read to for years so it was quite nice and it was great to hear the last chapter of the book series that made my childhood! Soon enough it was midnight and a large queue formed. As soon as I got my copy of the book I was overcome with joy and I couldn't wait to read it! I would've read it as soon as I got home if I hadn't had been so tired! Overall I had such a good time at my first ever book launch event! The staff at Waterstones Ipswich were great and catered for us really well and it was so magical to see many fans of the world JK Rowling created coming together to celebrate it! I have now read The Cursed Child and a review will be up shortly! Hogwarts will always be there to welcome you home!